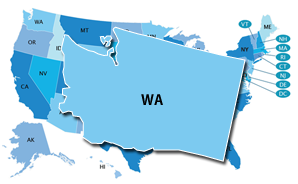 Washington state policy allows students to earn dual credit for academic or CTE postsecondary courses taken at their high school, a postsecondary institution, or virtually. Postsecondary institutions in the state are required to accept dual-enrollment credits (ECS, 2015). The Center for Native Education and Gateway to College National Network have partnered with institutions of higher education to provide 10 Early College High School programs as part of the Early College High School Initiative (ECHSI). More information about schools participating in ECHSI is available at the ECHSI website (Jobs for the Future, n.d.). Washington has adopted the National Career Clusters Model and is implementing all 16 Career Clusters. In Washington, the High School and Beyond Plan gets all students thinking about their future and how to get the most out of high school, so that they are ready to pursue their adult lives, no matter what direction they plan to take. Ideally, students write their plan in 8th or 9th grade and then continue to revise it throughout high school to accommodate changing interests or goals. Washington's High School and Beyond Plan is mandated by the state. It includes all students in Grades 8–12. Washington is currently developing a Early Warning System. The level at which Early Warning System data will be reported and who will be able to access the data is not publicly available.